The challenge: cut this without cutting yourself. The result: challenge failed. As previously documented on the Wall-Saver safety cylinder page, I ran into a QC issue that required a slight redesign. 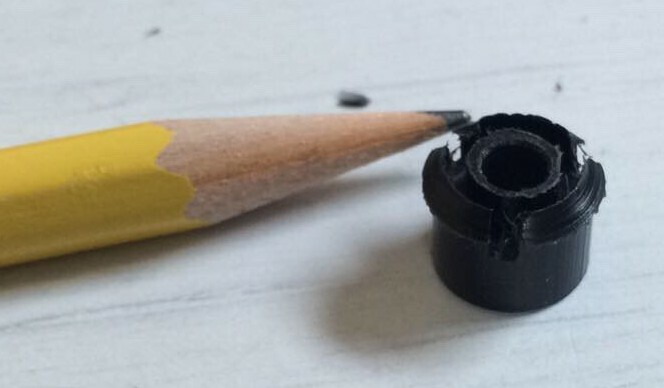 That involved replacing some molded polyurethane parts with machined nylon (to be injection molded in the future, but for now, machined). And that involved some post-machining trimming with a hobby knife. In the picture is one of the parts to be trimmed–they are about 3/8″ in diameter. You can probably guess where this goes–I slashed my thumb a good 1/8″ deep. Surprisingly, it didn’t really hurt, I only stopped working because the blood was an issue. 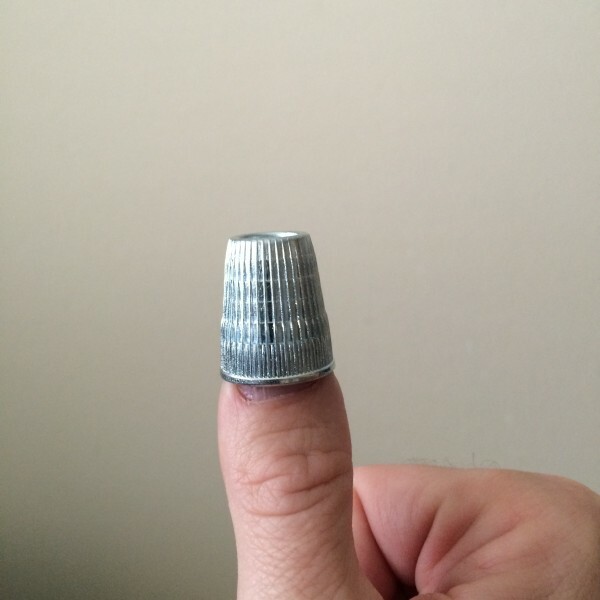 So of course, the obvious solution is thimbles. Off to the fabric store! The “extra large” thimbles? They just barely fit my index finger (really, tighter than I’d like), and perch on my thumb like a fez without a tassel. So off to Google it, and…you find women asking for “men’s thimbles” and being delighted to find a size 10. Except, yeah, that one I’m wearing is a 12. I did find a custom thimble maker–for merely $100, I could have one made to my specifications! Or for less than half that I could make a forged, heat-treated chromoly steel thimble (Rc 45) and Parkerize it. No, seriously, I really could. The finest tactical mil-spec thimble available! Get yours with a “punisher” logo! Surely, there are men who sew. Maybe they sew something manly, like holsters, I don’t know. Men with bigger hands than I have, even–because I frankly have pretty small hands. Anyway, next stop is the hardware store, where I should find copper pipe caps in a variety of sizes. There will be a “making of” blog series coming soon, but for now I need to finish this production run with no more injuries.